Will Becky Hammon be an NBA head coach? Will the Summer of Durant live up to the hype? All of the answers in SI.com's NBA notebook. LAS VEGAS—Before we get to the meaty issues of the week—the continued dismantling of the Nuggets, the dwindling number of prized free agents next summer and the early stranglehold Jahlil Okafor has on the Rookie of the Year race—a few words on the biggest star of the recently concluded Las Vegas summer league: Becky Hammon. Yes, Becky Hammon, the Spurs fledgling assistant coach, the first full-time female assistant in NBA history. Over the last two weeks, Hammon added another feather to her cap, coaching the Spurs summer league team to a championship. Chat with executives and scouts in Las Vegas and you will hear nothing but compliments from the people who have had time to get to know her. From her poise in what has to be an often overwhelming position to her basketball acumen, Hammon is universally respected. Bobby Marks, a former assistant GM for the Nets, tweeted that if he was running a team and had a head coaching opening, the first call he would make would be to Hammon. Be assured: He’s not the only one in the NBA with that opinion. Hammon won’t be an NBA head coach anytime soon. It’s not a knock—she has one year on the bench and zero NBA playing experience to make that fact ignorable. She still needs to master the game, to crystallize her own coaching philosophies, to do all the things, say, Mike Budenholzer did before he took over the Hawks job and emerged as one of the brightest young coaches in basketball. But Hammon will get there. In all likelihood, she will be offered another job first; the WNBA is bound to want her back and a major college would make a major splash hiring someone like her. But if the NBA is where her heart is, a few more years studying under Gregg Popovich and assisting a stacked San Antonio team deep into the playoffs, and Hammon will barrel through yet another barrier and find herself running her own team. Ty Lawson’s days were numbered in Denver before last week’s DUI arrest, his second such arrest in the last six months. The Nuggets struck gold (a. sorry for that pun; b. more on that below) with Emmanuel Mudiay, and bringing both Lawson and Mudiay to camp didn’t make sense for anybody. The arrest made trading Lawson more difficult, but it didn’t spark a decision to trade him. What the Nuggets got—a protected first round pick, prospect Nick Johnson and a bunch of non or partially guaranteed contracts they doesn’t have much interest in—isn’t much, especially considering that when you look past Lawson’s problems, there is a very good player there. Houston, which has made a habit of lurking in the shadows, waiting for a messy situation to break out so they can pounce, landed a top-10 point guard for a bargain basement price, better considering Lawson, for some reason, agreed to make the $13 million he is owed next season non-guaranteed. If Lawson plays up to his potential, the Rockets have little reason to cut him; if he fails or if his personal problems become an overriding issue, Houston can let him go and clear the cap space. The Nuggets lose a good player in Lawson but they do add another pick to a growing portfolio. Consider: Next year, Denver could have as many as four picks, putting them in a strong position to make a trade or restock the cupboard with young players that best fit Mike Malone’s system. They used the cap space Lawson’s departure created to extend Danilo Gallinari, tearing up the final year of his contract and giving him a three-year, $45 million deal. Make no mistake, this roster is a work in progress and its nowhere near a contender in a top-heavy conference. But at least Denver seems to have a direction. And it’s worth noting again: They have Mudiay, who, if the summer league means anything—and it often doesn’t—is going to be a star. He’s big, athletic, poised and shows the kind of polish off the court few young players do. Mudiay is now the official centerpiece of the Nuggets' rebuilding project. Expect Malone to ride him for 30-plus minutes a night next season—and expect Mudiay to deliver. How many times have you heard it: Next summer is the summer of Kevin Durant. Or, more specifically, it’s the 7-10 days when team executives, who have been hoarding cap space for years, will have the chance to convince Durant to accept a four-year, $160-million(ish) offer and come play for them. Several executives believe the Summer of Durant will make the Summer of LeBron (2010 edition) look tame by comparison. 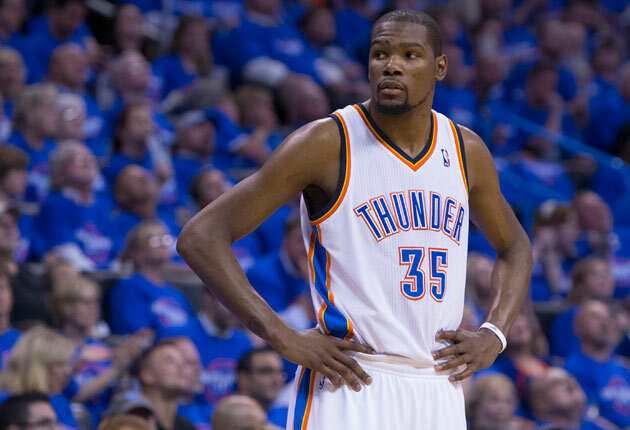 But here’s what else executives are talking about: Once Durant is off the board, who’s left? There’s LeBron, but he’s not going anywhere. Beyond that the cream of the crop includes Mike Conley, DeMar Derozan, Al Horford and Dwight Howard. After that it’s Joakim Noah, Rajon Rondo and Joe Johnson. Good players, yes. Franchise changers worthy of $20 million-plus max contracts? That’s a little more iffy. Still, the money has to be spent somewhere—the NBA negotiated minimum salary threshold will likely be around $81 million—which means fringe players will likely get contracts that will make your eyes pop. It’s why Oklahoma City wasn’t stupid to match the four-year, $70 million offer sheet for Enes Kanter or hand Kyle Singler a five-year, $25 million extension. It’s why the Clippers bloated payroll won’t look so bad when Jonas Valanciunas is getting paid the kind of money DeAndre Jordan is set to make. Stan Van Gundy took a beating for giving Reggie Jackson a five-year, $80 million contract. But, as Van Gundy told me on my NBC Sports Radio show, the fear of Jackson signing a one-year qualifying offer and entering unrestricted free agency next summer drove him to over spend on him this summer. Better get him on a big money deal now than risk losing him to a bigger one a year from now. Next summer isn’t the Summer of Durant. It’s the summer of the guys Durant is going to be partially responsible for helping get rich. What would a smart team do? Ignore it. Don’t splurge on Deron Williams because you need a point guard and have the money to (over)spend on one. Or, spend the money, but insist on short term deals. Because the summer of 2017 is when the real fun could begin (sound familiar?). That’s the summer of Stephen Curry. Of Chris Paul. Of Blake Griffin. Of Russell Westbrook. Of Derrick Rose. Better to be equipped with cap space then, when far more true franchise-altering players are on the market, instead of pinning your hopes on Oklahoma City failing miserably and pushing Durant out of town. Next summer promises to be crazy. The teams that may be benefit the most are the ones that won’t be participating in it. Such thoughts were natural. Philadelphia already had two young centerpieces in its frontcourt in Nerlens Noel, a Rookie of the Year candidate last season, and Joel Embiid, a talented center who was recovering from foot surgery that cost him all of last season. Where did Okafor fit? There’s no rule that says three big men can’t co-exist. But Okafor was uncertain—until he got on the phone with Sixers GM Sam Hinkie, who reassured him that he expected him to be in Philadelphia for a long time. Even now, Okafor’s long term future in Philadelphia is uncertain. But with Embiid done for his second straight season following a second foot surgery, Okafor will get an opportunity to play right away. Okafor put up strong numbers in Las Vegas (15.8 points, 8.4 rebounds), stats he could very easily duplicate in an enhanced role in the Sixers system. “He’s going to average 15-points per game next season, easy,” said an NBA head coach. Okafor is Philadelphia’s lone low post presence and if the Sixers have any chance of a the kind of balanced, inside-out game head coach Brett Brown has craved the last two years, Okafor will have to play a significant role. In conversations with Brown, a former Spurs assistant coach, Okafor has asked about the habits of Tim Duncan, a role model Brown would love for Okafor to use as a standard. Breeding stat-stuffing rookies has become something of a habit in Philadelphia. Michael Carter-Williams was the Rookie of the Year in 2014 and Noel made a strong case for the award last season. Expect Okafor to join that list. •​ D’Angelo Russell’s mediocre performance in summer league (11.8 points, 3.2 assists and a whopping 5.2 turnovers per game) shouldn’t scare Lakers fans, but it does reinforce the belief that Russell is a project, much more so than Mudiay, who should put up far better numbers next season. Still, Russell is a gifted playmaker with unteachable instincts and court vision. He’ll be fine. • Classy move by Mark Cuban in freeing Richard Jefferson from his commitment to sign with Dallas. Last week, Jefferson agreed to terms on a minimum deal to return to the Mavericks before DeAndre Jordan reneged on his commitment to Dallas. With Jordan gone, Jefferson’s desire to play for a contender led him to Cleveland, which needed wing help. He contacted Cuban, who, while not having any contractual rights to Jefferson, gave him his blessing. Professionally handled by both sides. • Summer League Overreaction: Bobby Portis can play. Portis’s tumble from a projected mid-teens pick to Chicago at No. 22 was perplexing. He’s a big, skilled power forward who makes up for a lack of elite athleticism with a relentless motor. Portis averaged 14.5 points and 8.7 rebounds for the Bulls in Vegas, and he should find a home backing up Pau Gasol and Taj Gibson in Fred Hoiberg’s rotation. • Kendrick Perkins won’t play much for New Orleans, but adding a playoff experienced center with a championship ring for the veterans minimum is a nice pickup for the Pelicans. Perkins experience can only benefit the development of Anthony Davis.